A Las Vegas restaurant quickly turned to Facebook in hopes of finding a thief who snatched a customers purse while she was eating. The posting on the Aloha Kitchen and Bar Facebook page had more than 11,000 views as of midday on Tuesday. 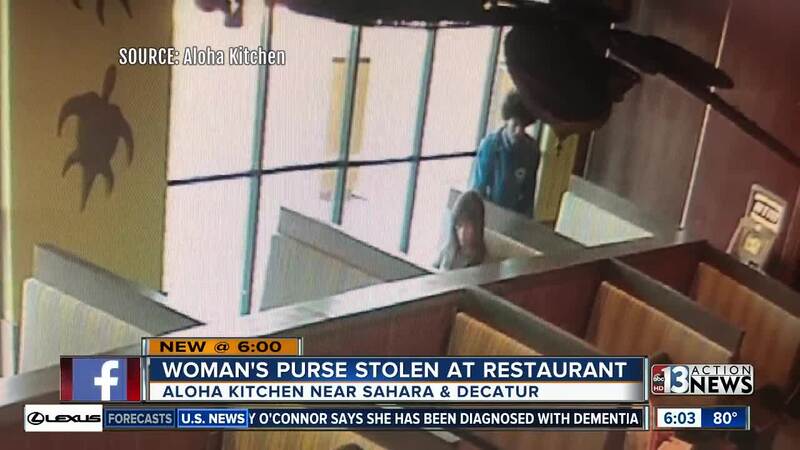 It shows a suspect closely watching Ann Francioli as she was eating in a booth alone. After about 30 seconds the suspect lunged over the back of the booth and grabbed the purse before running out of the business. "All I could think about was this person was taking my bag and I just ran after him," Francioli said. After spending the night canceling credit cards and getting the locks changed on her home, Francioli said a stranger knocked on her door and returned the purse with everything but her cell phone inside. While she has most of her belongings back and says she forgives the suspect, Francioli said she still wants the man caught.